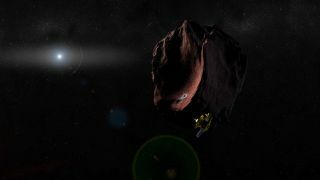 An illustration depcits NASA's New Horizons spacecraft encountering a Pluto-like object in the distant Kuiper Belt. Like Pluto, 2014 MU69 lies in the Kuiper Belt, a ring of frigid bodies past Neptune. This second flyby is not firmly on NASA's books, however; the space agency must still approve an extended mission for New Horizons. The probe's operators plan to submit a formal extension proposal early next year, mission team members said. New Horizons' historic encounter with Pluto revealed the dwarf planet to be an incredibly diverse and geologically active world, complete with towering ice mountains and glaciers of frozen nitrogen. The views from the second flyby will be quite diffferent (if it happens), for 2014 MU69 is a very different world than Pluto. For example, scientists think 2014 MU69 is just 30 miles (48 km) wide or so, whereas New Horizons found Pluto's diameter to be 1,473 miles (2,370 km). Small Kuiper Belt objects are more pristine and primitive than dwarf planets like Pluto, so flying by 2014 MU69 could shed light on the raw materials that coalesced to form the planets 4.5 billion years ago, scientists have said. "Linking the materials that we find in the Pluto system to these much smaller objects is going to really open our eyes to what the planets are made of," Scott Sheppard of the Carnegie Institution for Science in Washington, D.C., who is not a New Horizons team member, told Space.com in August.